A group of international rowers have made their first strokes of a week-long tour of the Marlborough and Nelson regions. Some tourists are content to see New Zealand from the comfort of a rental car or campervan - others like to stick the oar in a bit. 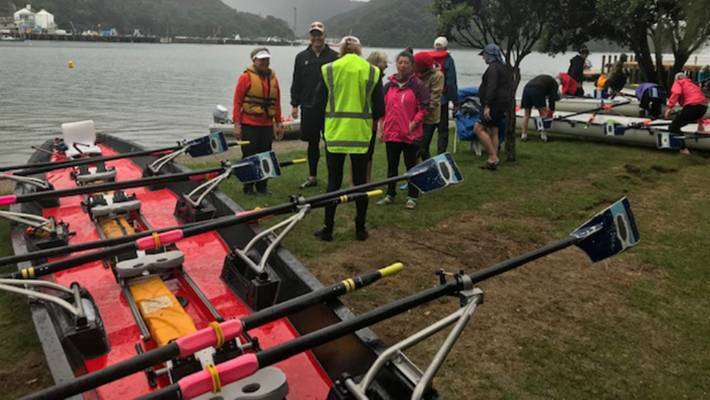 A rowing regatta with a difference is under way in Marlborough this week, with the 2019 FISA World Rowing Tour leaving Picton this week for a week-long excursion around the top of New Zealand's South Island. Billed as a casual way of enjoying the surrounds as opposed to a race, the tour is being hosted by Nelson Rowing Club (NRC) and is run under the banner of Fédération Internationale des Sociétés d'Aviron (FISA), the governing body of rowing. This tour has 42 Participants from 10 countries, rowing in eight coastal quad boats containing four rowers each plus a cox. Australians made up the largest portion of the international contingent with 15 rowers. Denmark provided the next highest representation with seven, with Canada, Austria, Ireland, The Netherlands, Norway, Switzerland and the USA filling the remaining spots. There was only one New Zealander on the tour. Volunteers from NRC are organising duties for the tour, while other rowing clubs from around the country have helped with hiring a few boats and a boat trailer. The tour party and organisers were given an official welcome at Picton's Waikawa Marae on Tuesday evening. Sally Knight, organiser and club secretary of NRC said the early feedback had been "extremely positive" from the overseas guests who had been made to feel welcome ahead of their rowing excursion. The first part of the tour involves three days of rowing through Queen Charlotte Sound, taking in a range of sights and stops from Momorangi Bay and Kumutoto Bay to Kaipupu Point Bird Sanctuary and Lochmara Lodge. The final few days are spent on the other side of the Whangamoas and involved a row of Lake Rotoiti before a leg between Nelson and Mapua to finish proceedings. Last year's tour was held in Spain, with the 2017 tour taking in the sights of Italy. Another tour will run in Finland later this year, with participants travelling in traditional Finnish Church boats of 14 rowers and a cox. Immediately after this Tour, four of the boats are being sent to American Samoa and Samoa to promote rowing in the Pacific.